A 2-month yoga course (available to you for up to 365 days). You know how we always talk about home practice? Do you have one? I am asking as it’s often a lot of talk, a lot of wishing… planning and thinking and not much doing. I know, I’ve been there. But how did I get here? By building a habit. And you can do too. There are no secrets…. Now Yoga is just something I do. All you gotta do… is sign up & log in… any time of day! Your video will be waiting for you. And the cool thing is, you can start this program anywhere, any day, any month. This program focuses on working on to or toward 3 major level I poses that grow strength & confidence; Urdva Dhanurasana (Wheel), Adho Mukha Vrksasana (Handstand) and Sirsasana I (Headstand). Whether or not you know these poses or even do them is not important. The aim is to start where you are at and grow your skills, your abilities. You just have one video a day, just one! If you miss a class, don't stress, just get back on the bus and keep going. Don't ever miss 2…that's our deal. 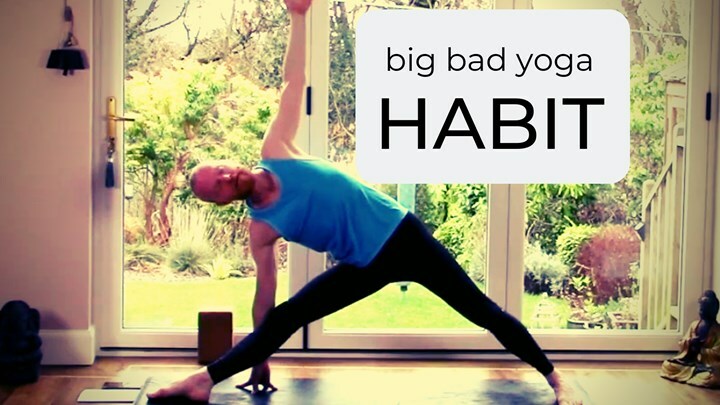 Come join me and begin to build a big bad yoga habit. You know you want to. Welcome to the HABIT program! In this short video, I say hello and tell you what you need equipment wise and tell you a little bit about where we are going. Learn how to place your hands and feet in the most fundamental and powerful yoga asana (pose), Down Dog. Learn how to engage your legs in Down Dog & a Standing Forward Fold. A simple standing pose focusing on your hamstrings, Dangle. Learn a great strength building asana, the Plank. We finish week one with a moderate Yin Yoga backbend. Welcome to the HABIT program week 2! In this short video, we catch up and talk about moving on now to 10 minute classes. Go for it! A progressive bunch of standing forward folds... engage your legs! Oh, and a headstand. A short practice with just one pose... a deep twist on each side. Welcome to the HABIT program week 3! In this short video, we catch up and talk about moving on now to 15 minute classes. We talk about revisiting our motivation for the program. We have 15 mins, so let's really begin to build strength with a few stronger poses. Learning how engage power in our legs, we work into a bunch of standing forward folds and two inverted forward folds, Dolphin & variations of Plough and Salamba Sarvangasana I (Shoulderstand). We do a simple forward and backward bend to stress and stimulate the lower pelvic region and tops of the legs. Find openness here to provide openness all the way up the spine and torso. We move towards Bow Pose (Dhanurasana) & Wheel Pose (Urdva Dhanurasana). A great little practice if you need a boost. Welcome to week 4! This week, we up the ante to 20 minutes. In this short class we work on lengthening the back of the body while strengthening the front working toward headstand (Sirsasana I) and Shoulderstand (Salamba Sarvangasana). In this short class we look at 2 asymmetrical Yin Yoga poses, the Dragons & a Prone Twist. In this short class we work on lengthening the front of the body while building strength in the back of the body... switch it round! In this short class we do 4 Yin poses. That's almost power Yin it is so fast. In this short class we explore Sun Salutations with a focus on engagement to lengthen the back of the body. In this short class we explore Sun Salutations with a focus on engagement ready for (or actually doing) handstand at the wall. Come get it on! In this short practice, we focus on power and celebrate spinal extension. We start easy with some Sun Salutations, then open it up. So come along with me and open up your body... and maybe some other things. In this 30 minute class, we spend 1/2 our time in forward flexion and the other 1/2 in backward bending or spinal extension. Great for your back... let's see what you think. In this medium length practice, we build on sun salutations and standing poses towards Adho Mukha Svanasana. In this 40 minute class, we work toward Sirsasana ! (Headstand I), Salamba Sarvangasana (Shoulderstand).... and Savasana! We work with this principle that pulling in, rather than pushing out helps us gain strength, stability and therefore confidence and ability. In this short class we work on moving the spine in its 5 directions of movement. Great for lower back pain and mobility. In this slightly longer class, we slow it down and work through some critical actions for Urdva Dhanurasana (commonly known as Wheel Pose). Whether or not you go for the final pose, grow strength and flexibility as you open up. Learn to big up the little guys, give the forgotten things their chance... sometimes bigging them up changes everything... and not just on the yoga mat. In this forward fold class, we focus on engaging the adductor muscles. Learn where they are... and more importantly, how to use them. In this longer practice we focus on the middle layer of the body, the Liver and Gall Bladder Meridian lines which facilitate Qi flow in our outer thighs and groin. Let go, then go big! You'll be surprised to see what you can do when you let go (in your head). We focus on the kidney & urinary bladder channels. We pause and soften before we build strength. In this arm balance focused class, we take it slow and steady. Pulling in to focus more on the small muscles, we fold forward and move toward headstand and shoulderstand. In this quiet Yin class, we listen to the body & mind as we practice. It's celebration time... go on... Join me. We focus on the spleen and lung channels in this medium length Yin practice.